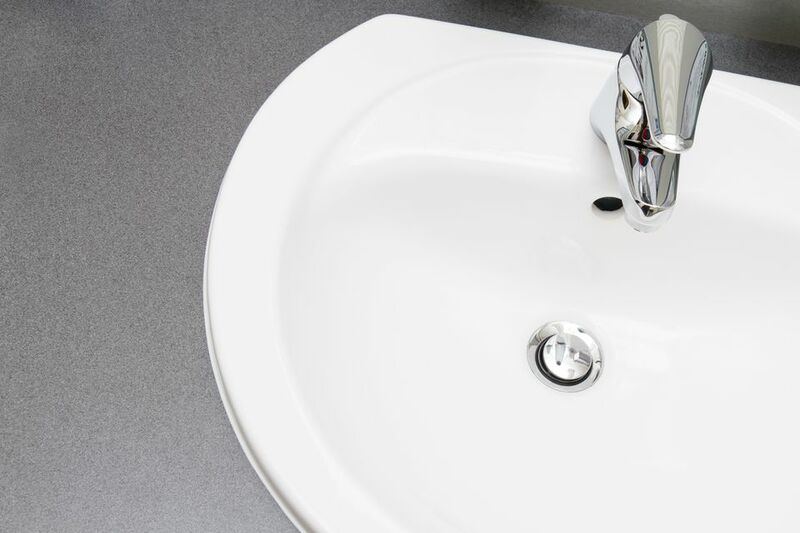 A bathroom sink pop-up stopper is a very convenient feature, and while installation is usually easy, occasionally the process gets slightly complicated due to variations in the fixture or fittings. If you need to install a new pop-up drain for any reason, these instructions will simplify the process. NOTE: in this example, the parts are being installed while the sink is removed from the vanity. While sink drains are sometimes installed this way when you are installing a new sink, in practice you may be installing the pop-up drain on a sink that is already in place. Removing the old drain assembly is often the most difficult part of the entire project. Loosen and remove the P-trap from the branch drain and sink drain tailpiece, using channel-type pliers. Next, remove the old pop-up assembly, if there is one. Use channel-type pliers or a basin wrench to remove the mounting nut from the tailpiece on the old drain assembly, then lift the assembly clear of the sink. Clean the sink thoroughly of debris and old plumber's putty. Disassemble the pieces of the new pop-up assembly, and unscrew and remove the mounting nut from the drain tailpiece. Install the plastic washer then the rubber washer and push it all the way down on top of the mounting nut, as shown here. Next, apply a thin layer of pipe joint compound to the top side of the rubber washer that will fit against the sink. Using joint compound on the rubber will ensure that it seals against the bottom of the sink drain opening. While pipe joint compound is not strictly necessary, without it, you might have trouble getting the rubber to seal. Apply a generous bead of plumber's putty to the underside of the flange on the sink drain fitting. The putty will help the upper part of the drain assembly seal against the sink drain opening. If you do not have plumber's putty or cannot use it on your type of sink, then you can use silicone or even the foam or rubber gasket that comes with some pop-up assemblies. Push the pop-up drain tailpiece assembly up through the drain opening from under the sink as high as you can. While holding the drain piece in place, fit the chrome drain ring into the opening from the top of the sink. Thread the chrome drain ring onto the drain tailpiece as far as you can by hand Make sure the pieces are threaded correctly and are not cross-threaded. For now, it only needs to be hand-tightened enough to hold it in place. From under the sink, hold the drain tailpiece with one hand and tighten the mounting nut upwards toward the bottom of the sink. Make sure the opening in the tailpiece where the pop-up pivot lever will fit is pointing straight back towards the wall. Tighten the mounting nut with channel-type pliers while continuing to hold the tailpiece in place. Do not over-tighten this nut, but make sure it is secure enough so that the drain assembly does not spin in the drain opening. Push the pop-up stopper down into the drain opening inside the sink, making sure the hole in the linkage is facing toward the back of the sink. Once the stopper is in position, insert the pivot rod into the opening in the side of the tailpiece from under the sink. Usually, there is a plastic washer on each side of the plastic ball. You should be able to feel the tip of the pivot rod slide through the opening in the stopper linkage inside the drain assembly. Screw the pivot rod nut onto the threaded fitting on the side of the tailpiece, so the ball is secured to the tailpiece. Push the pivot rod up and down to make sure the stopper goes up and down freely in the drain. If the pop-up is working properly, you can tighten the nut hand-tight. If the pop-up is not working, reposition the stopper and pivot rod so the pieces connect properly. Feed the vertical pop-up lever down through the hole behind the spout of the faucet. Before connecting the horizontal pivot rod to the vertical lever, make sure your stopper is in the fully up (open) position. From below the sink, attach the connecting strap to the end of the vertical pop-up lever. This needs to be screwed tightly before connecting the strap to the horizontal pivot rod. Connect the vertical strap to the horizontal pivot rod by threading the spring clip onto the rod. One end of the clip needs to be on each side of the strap. After the two rods are connected, check to make sure that the pop-up stopper opens and closes fully inside the drain opening. If it doesn’t, you can make some adjustments to the rod connections by pinching the spring clip. Finish by reconnecting the P-trap to the drain pipe and drain tailpiece. Checking for leaks by filling the sink up and draining it.